Patio season is here, which means time to spruce up your outdoor space! Your backyard space should feel like any other room in your home, cozy and welcoming. Despite the space you may have to work with, big or small, you can always find something that will suit your needs! Whether it’s a bistro, lounge chair, or a full patio set, your options are endless! Personally, at our home, we are always going back and forth about what we like and what we need. It’s an ongoing dilemma we face every year, so we understand the struggle. Your backyard space should be a place of enjoyment, connection, and relaxation on those beautiful sunny days! Here are my top ten tips I recommend following when choosing the right outdoor furniture for your space. Try Before You Buy: Make sure you all take a seat before you buy and try to imagine it in your backyard and your family using it. Just like indoor furniture! How To Clean: Finding a set that’s easy to clean and care for is a huge, especially when they live outside! Something that’s quick to wipe down keeps your furniture in excellent condition for years to come. Colours: The best thing about outdoor furniture is all the colour selections you can choose from. Go with something that best suits you and your style. Something that fits into your backyard. You can choose something fun or stick with neutrals. 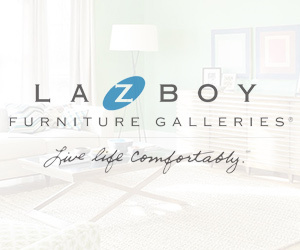 Small Space Storage: If you do have a smaller backyard finding a set that also offers storages saves on space, La-Z-Boy has a great selection! Quality over Quantity: That’s a big motto in my home! Make sure you’re buying something that will last you for years to come. Weigh your options: Decide on what you may think you’ll use the set for more? Dining or lounging! This will help guide your purchasing decisions. Storing Inside: When you store your furniture in the winter months make sure you have space inside to accommodate your new purchase! Measure Your Space: I recommend taking measurements of your area before buying to ensure everything will fit properly! Accessorize: You can do a lot to spruce up your outdoor furniture with umbrellas, pillows, ottomans & outdoor mats! Choosing Materials: Whether it’s wood, plastic, or wrought iron you should select your material based on the weather conditions they will be facing! Loving Littles Blog is dedicated to the modern mom. Here I’ll share with you stories of life & style, beauty & DIY, and everything else in between for you and your littles. I’m a proud soon-to-be wife to my high school sweetheart Drew and a blessed mama to two littles Owen 7 & Ella who’s soon 2. For a free In-Home Design Consult, e-mail us here.